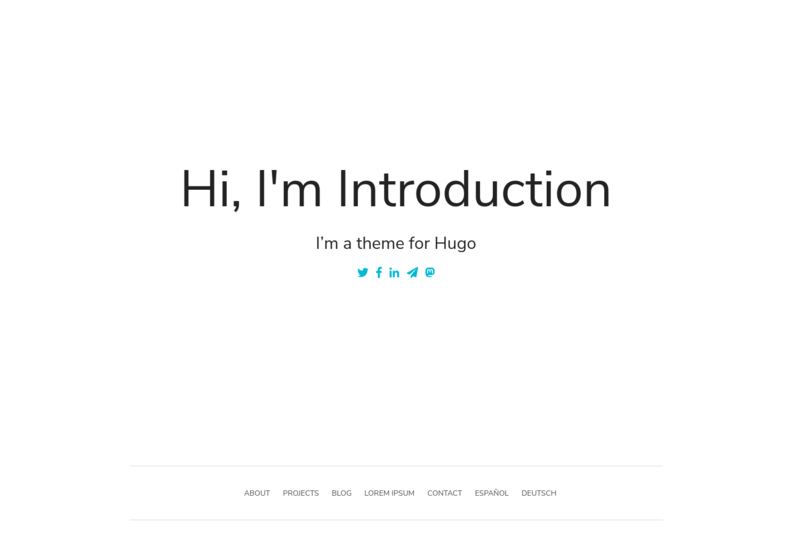 Introduction is a minimalist, highly-versatile theme for Hugo. It can be configured as a single page, or as a full-featured site with multiple sections. It is multilingual, responsive, and includes a light and dark theme. Then visit http://localhost:1313/ in your browser to view the example site. The following explains how to add content to your Hugo site. You can find sample content in the exampleSite/ folder. The title frontmatter will be the first large heading. The content of index.md will be shown as a subtitle line. You might want to set headless to true in the frontmatter. See headless bundles for more information. Content for the home page lives under content/home/. You may add as many files as you want to in markdown format. Each markdown file will show as a section on the home page and can be ordered by the weight value in the file’s frontmatter. You can set image to show an image on the left side of the section. The image file must be in the content/home/ folder. This will always be shown as the last section on the home page. Introduction provides an easy way to showcase your projects. Each project can even have its own gallery, shown as an image carousel. Add a title and some optional content to the file. The frontmatter of your new file contains some comments to help your configure your project. You can set external_link to make the project link to another website. Posts will also display in the Blog section of the home page. From exampleSite/, copy config.toml to the root folder of your Hugo site and change the fields as you like. Helpful comments are provided. Introduction currently ships with support for English, German, Spanish and French. Contributions for other language translations are welcome. To create a new language translation, add the .toml file to the i18n/ folder. See the existing files for the necessary fields. See the hugo documentation for more details. Introduction contains a default menu. If you want to override this, you can do so by defining a menu.main in config.toml. Set googleAnalytics in config.toml to activate Hugo’s internal Google Analytics template. Set disqusshortname in config.toml to activate Hugo’s internal Disqus template. You can add custom css files by placing them under assets/ and adding the path to the file to customCSS in config.toml. If you have a question or get stuck, please open an issue for help and to help those who come after you. The more information you can provide, the better! Pull requests for bug fixes and improvements are welcome.